This paper is the second in a series that describes how Modern Asset Pricing (MAP) may be used for project evaluation in the upstream petroleum industry. It has two goals. First, it demonstrates how MAP can be applied to the general class of projects where the project manager does not have any future flexibility that must be analysed. Second, the usefulness of MAP in fiscal system analysis is illustrated by the evaluation of a series of oil-field development projects under a variety of fiscal regimes. In situations where different fiscal systems have the same effect on a discounted cash flow (DCF) basis, the value of afield to a developer may appear quite different when analysed using MAP. MAP takes into account the differing risk characteristics of the cash-flow streams of the developer and the government or resource owner, and provides us with an added dimension of information: comparisons of how different fiscal systems distribute risk among the parties involved in the project. Proceedings - Does the Modern Asset Pricing Approach Affect the Optimal Investment Project Structure? 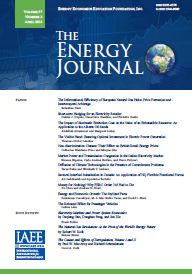 Published in Volume19, Number 1 of The Quarterly Journal of the IAEE's Energy Economics Education Foundation.